"No sooner did a trio of University of Texas art history graduate students decide to make official their idea for a curatorial collective then a buzz started percolating. In March of last year, Jessi DiTillio, Kaila Schedeen and Phillip Townsend launched themselves as, Neon Queen Collective, an enterprise to pool their interests and together produce socially engaged art projects that examine race, ethnicity, representation, class, sexuality, and gender by female identified artists of color...."
"Neon Queen Collective is a trio of Austin-based curators—Jessi DiTillio, Kaila Schedeen, and Phillip Townsend—who collaborate to investigate topics such as race, ethnicity, representation, class, sexuality, and gender in socially engaged art produced by feminist artists of color. Their first project (an ambitious two parter) features Afro-Cuban artist María Magdalena Campos-Pons. Her exhibition Notes on Sugar is currently on view at the John L. Warfield Center’s Christian-Green Gallery through May 3, 2018..."
"As an undergrad art history student at the University of South Florida, Phillip Townsend met the subject of his thesis, the Afro-Cuban artist María Magdalena Campos-Pons. “I met her during undergrad and followed her work and pitched the idea to her about a show, and she was like, 'Whenever you are ready let me know,'” Townsend says. 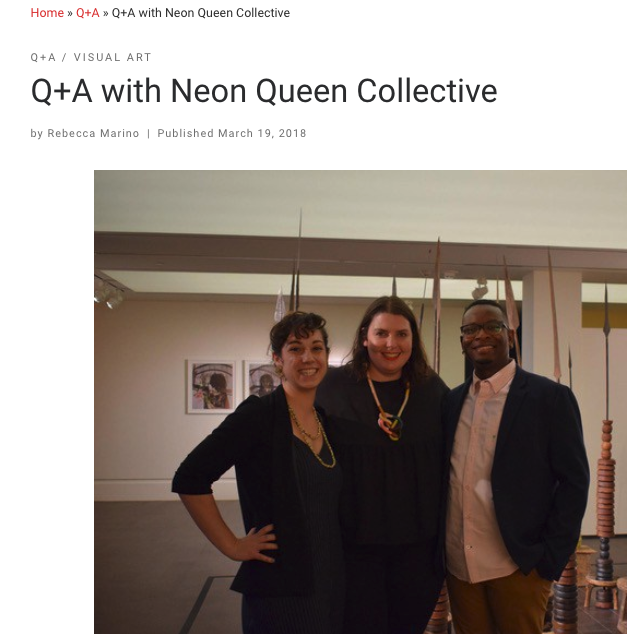 Fast forward a few years to last spring, when Townsend and fellow University of Texas art history doctoral students Jessi DiTillio and Kaila Schedeen decided to create the curatorial group Neon Queen Collective, and they were ready. They reached out as a team to put a show together...."
"Betelhem Makonnen: What’s your origin story? Kaila Schedeen: The idea came from a call I saw from the Visual Arts Center at UT for open proposals to do a show. We are all working within an academic setting and have backgrounds in curation and are interested in the ways curating can reach people in ways academia cannot. It allows for a lot more experimental processes and the development of relationships. I approached Philip and then we felt a third would be a magical number so we invited Jessi to join, and it’s been the perfect blend of each of us having different strengths. So it started in March 2017 and we’ve grown since then. Philip suggested us doing this project on María Magdalena Campos-Pons and so that’s where we began..."